Yes, we’re still working on the apartment! Everything takes three times as long as you feel like it should, of course, but we’re getting there. The little dining area in the kitchen is now complete, and last night we ate our first dinner (roasted red pepper soup, tiny boiled potatoes with dill, and a salad) at our new table. 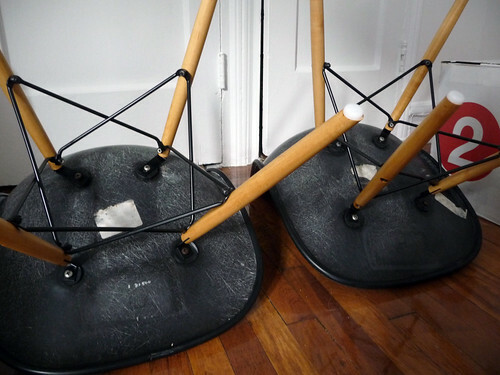 Two and a half years ago, I mentioned swapping out the original stacking bases on these vintage upholstered Eames shells for dowel rods, and I just now got around to it. (I bought the bases on eBay.) They look great. I should have done this sooner instead of just relegating the chairs to the basement for so long. The flip-down table is the NORBO from IKEA in birch. I had originally planned to paint the entire thing black, but the wood is nicer than I had expected it to be. I opted to just paint the bracket to make it blend with the wall so that the table looks like it’s floating. p.s. For those who like to know, the paint colors are Benjamin Moore ‘Soot’ and ‘Simply White’ (Aura Matte finish). The Stendig calender is by Massimo Vignelli, and the ceramic ‘Fire’ candle holder is by Nathalie Lahdenmäki. I really admire your handiness. That is a brilliant use of space! Black, white and wood! Looks amazing and I love how functional that flip down table is. Awww….the chairs look great! Love the idea of the table on the wall! Gives you so much space. Still loving that tile floor! i LOVE what you’ve done with those chairs! gorg! especially against the black wall. Really nice!!! I am decorating my apartment too and I have to decide if I will buy Eames chairs like yours or Panton chairs. I want the two of them to be white. I love those bases. 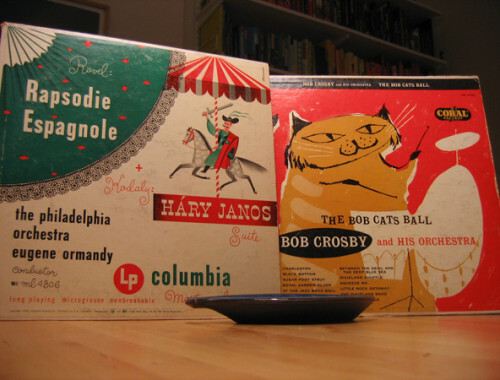 If I EVER get an eames chair, I would definitely get those bases. Love the black wall in the kitchen. so bold! Beautiful and simple set up! Very elegant! Wow this is perfect for my little, teeny, tiny kitchen! I was planning on painting the wall in chalkboard paint, your project turned out great! Congrats on getting around to the chairs, the whole set up looks gorgeous! Looks really great! 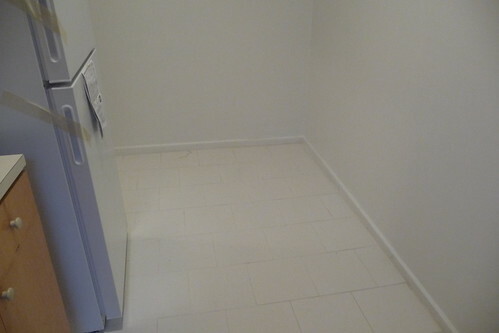 So simple but the dreaded rental apartment kitchen looks classed up! Mellany: The tile was in the apartment. It’s just 12×12 ceramic tile — probably $1/sf at Home Depot. Not something I would choose, but at least it’s white! katie: These two chairs are narrow-mount. 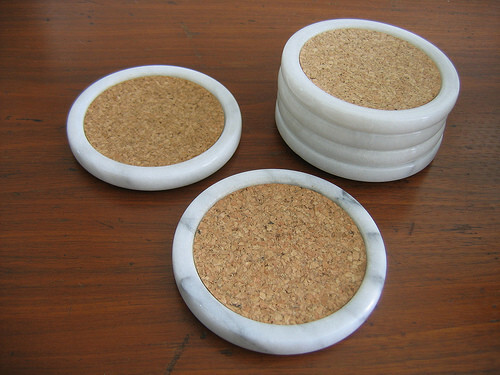 The older stacking (DSS) bases are wide-mount, but these are from a later production year. I think the adapter bracket I mentioned is a good option for you — I’d do that before attempting to move the mounts, personally!! Really nice job. You’ll be happy to know that the Stendig calendar will flatten out after a couple weeks. Ours just did. All you need now are some of those IKEA herb garden plants to add a little nature and green. Those chairs looks so good with the dowel bases! The whole area is very cute. Looks great. I was thinking of buying one of these IKEA tables to use it as a desk but I wonder how stable it is. I hate desks that are unstable or, even worse, make all sort of squeaky sounds. Do you think it would work decently as a desk? Thanks. Daria: The table is completely stable and rock-solid. No wiggles or squeaky sounds! It would make a great desk. Just make sure you use the right kind of mounting hardware for whatever your walls are made of. I love the wood against the black. I think it makes the wood look richer. Wow you guys never disappoint with your home projects. The place looks so good. Did you install new baseboards in the kitchen? I was just in Palm Springs planning renovations on our condo and one thing I had to make a decision on was baseboards. Baseboards are not something I’ve put much thought into before but we decided to go with 1X3 inch straight edged baseboards. I’m hoping that will be suitable for the modern look I’m going for in our mid-century condo. So many decisions to make and of course things always take longer than you think they will. dee: No new baseboards. All we did was paint. If you’re installing new basboards and want a modern look, I suggest going much taller than 3″ — try 1×6″ square-edge boards instead (with no quarter round). yay! the kitchen looks just fabulous. Well done on holding back on painting the table, it looks great “floating” there. Your projects are wonderfully inspirational. Wait a second… I think I missed something! You have the house in Newburgh AND a new apartment too? Or did you move back to the city? I agree with Katie–the keeping the table top as-is works great with the nice new legs. I appreciate that while you’re consistent with your aesthetic, you always find new and creative ways to express it–even with the limitations of a rental. Beautiful! I have a confession to make. I am completely copying elements of your apartment kitchen I love it so much! Black wall and varde shelf unit and Stendig Calendar (at least until I can bring myself to shell out the money for Vitra’s Utan Silo wall pocket organizer). I hate my existing kitchen and you’ve provided solutions I love. The only thing I’m thinking of adding is my set of flying hooks which I’ve been looking to find a home for years… I just can’t decide if it will look too sloppy hanging dishtowels off of them… Thanks again for all the inspiration! Tolmsted, I’m copying some of it, too! I bought the Varde wall shelves (already installed and look great) and the Varde shelving unit (just about to go put together, hope it’s easy…) and also I’m changing out my Attest knobs to the Snodds. No paint for me, though, my walls are Benjamin Moore’s Regal matte 1B… bright white, I like that shade. 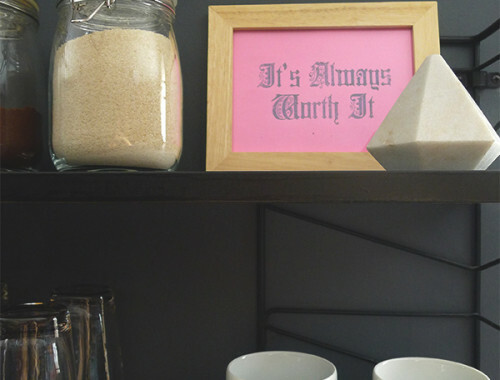 Anyway, Anna, love what you’ve done, it’s obviously a total inspiration, and I am so happy that this came along just in time to get me inspired for the kitchen! Can’t wait to see the rest of the apartment. AMAZING transformation! I love it all. Oh hello, that looks awesome! Anna, you have such a beautiful eye – keeping things honest and simple and letting the beauty of each object speak for itself. Just love it. Oh, and good move keeping the timber table top. Works really well with the new dowel legs. Excellent job Anna! Which months are you looking forward the most? the white ones or the black ones? Your changes made the floor look 100% better than the before kitchen pic. Amazing what a little paint and good design can do! So inspiring! I just took a NYC job and will be frantically looking for a teensie little closet-sized studio of my own. Still plan on heading upstate every weekend. I will definitely be watching how you bring it all together. The timing could not be more perfect! So glad you are blogging this latest development. much as i love the apt re-do, it does more and more sound like the kiss of death for newburgh. So according to that Stendig site this calendar will cost me 10 000 AUS dollars. Our exchange rate can’t be THAT bad, I must be doing something wrong. Do you buy yours from that site? Beautiful!! I never thought the Norbo table could look so good. Love, love, love the wall! Black paint is MAGIC!! jeannette: I think Newburgh will survive without us sleeping within its borders a few nights a week! suzanne: No, I bought mine at Crate&Barrel (sold out now). You should look for someplace local to buy it — there are distributors all around the world! You may be out of luck for 2010, though, as they tend to sell out quickly. My partner bought me a Stendig again for Christmas, I put big bulldog clips on the corners to stop it curling up. it looks crazy chic! it also looks like you are having a lot of fun dressing up your new apartment. Wow, well done! The lone black wall and chairs look amazing! I thoroughly enjoy your blog. Thanks for all the inspiration! Looks absolutely wonderful. Have been admiring your website from afar. Question for you. Did you sand the Norbo table before painting? How does the finish hold up? Elisa: No, I didn’t sand first. I just used a very good primer. If I were painting the top, I would have sanded (before and between coats) and topped it off with a coat of poly. I know what you mean about chairs in the basement. Ours is getting out of hand too. One being of the same chair you have in this post. The dowel legs look amazing and the space does too! Well done. While I am not living in NYC (wish I could though) I am renting a house in the burbs of Vancouver, Canada and can relate to your “landlord that cares…” comment. I too have painted and covered things up without getting “permission” because they just don’t seem to be involved with their house and do the simple maintenance it requires! I love how you painted black in the kitchen, you took a boring and blah space to “WOW” without much money and a coat of paint! Everything you have done so far is amazing and what a wonderful transformation. I am passing this along to my apartment dweller son. It is GREAT!! I absolutely love your kitchen area. I’m a fan of black walls and did one in my past apartment. Currently I’m in a brown phase but I know I’ll be ready to switch back to black the next time we move! 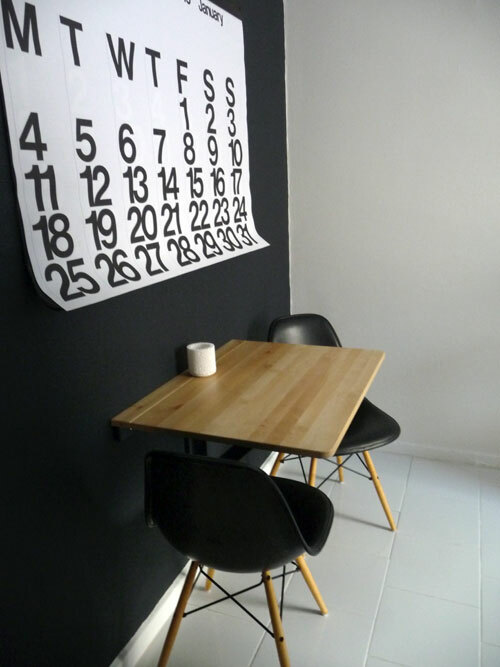 The black painted wall it’s inspiring me, I love the big calendar on it. 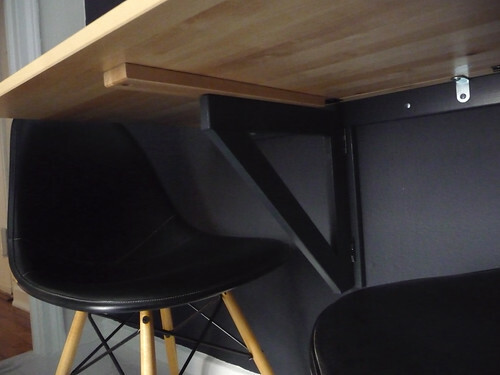 And the new wooden bases are perfect for the eames chairs! we have that calendar too! my mother- in- law gave it to us for xmas…she gives good gift! and your dining area is sik! Y’know, we were shopping this weekend and saw a couple Eames chairs with strikingly similar legs selling for hundreds of dollars each! Good on ya, girl. Brings back memories…. 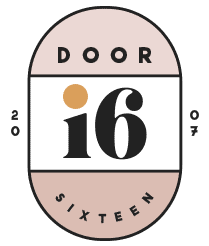 I used to work for a small graphic design firm in Manhattan – until about ten years ago. 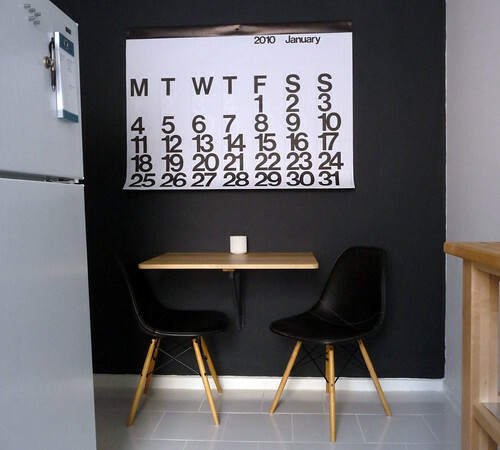 We had those chairs (on casters) and always had a Stendig wall calendar. love your blog! was introduced by way of AT, and i read through ALL your entries over the course of the day yesterday. love your home, your attitude towards life, and your puppies!